(a) Interspecific Hybridization/Hybrids: Hybrids or hybridization between different species within the same genus are called interspecific hybrids or crosses. (b) Intraspecific Hybridization/Hybrids: Hybrids or hybridization between different sub-species within a species are called intra-specific hybrids. (c) Intergeneric Hybridization/Hybrids: Hybrids or hybridization between different genera are called intergeneric hybrids. Plant hybrids are often stronger than either parent variety. 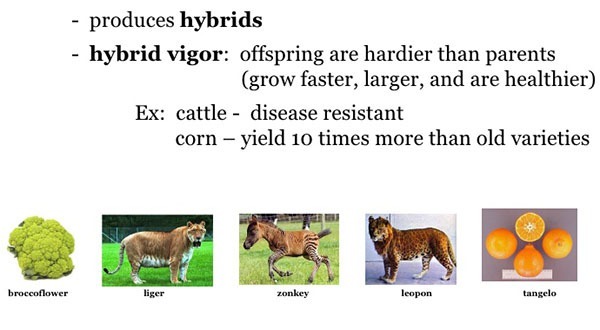 This phenomenon is known as hybrid vigour (heterosis) or heterozygote advantage. Plant breeders make use of a number of techniques to produce hybrids. (a) Leyland Cypress, a hybrid between Monterey Cypress ‘E and Nootka Cypress. (b) Limequat. lime and kumquat hybrid. (c) Loganberry, a hybrid between raspberry and blackberry. (d) London Plane. a hybrid between Oriental plane and American plane (American sycamore). (e) Peppermint, a hybrid between spearmint and water mint. (f) Tangelo, a hybrid of a Mandarin orange and a pomelo or a grapefruit which may have been developed in Asia about 3,500 years ago. (g) Triticale, a wheat-rye hybrid. (h) Wheat; most modern and ancient wheat breeds are themselves hybrids. Hybridization creates multiple variations across genes or gene combinations. Successful hybrids could evolve into new species within 50-60 generations. This leads some scientists to speculate that life is a genetic continuum rather than a series of self-contained species. A hybrid may get a normal botanical name; this will usually be the option of choice for naturally occurring hybrids. A hybrid may also be indicated by a formula listing the parents. Such a formula uses the multiplication sign “x” to link the parents. A hybrid name is reserved for horticulturally arising hybrids and artificial and/or forced hybrids. A hybrid name is indicated by a multiplication sign “x” placed before the name or epithet, as the case may be. A hybrid name is a botanical name, and is treated like other botanical names. The multiplication sign is not part of the actual name. This means that, say, Drosera x anglica for nomenclatural purposes is to be treated as Drosera anglica.